Since Luke started Kindergarten the boys have a new bedtime, 7:30 p.m. Since their bedtime is earlier, I don't mind if Logan doesn't fall asleep during his rest time (because when he takes a long nap, he's not ready for bed that early). Today, though, our Wednesday night youth groups resume. Since we have an evening activity I really wanted Logan to fall asleep during his rest. After he laid in his bed for about an hour and hadn't fallen asleep, I let him get up. 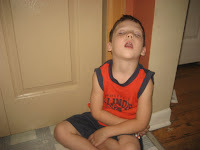 I guess he really was tired though, because after he'd been "awake" for a few minutes, the house was dangerously quiet. 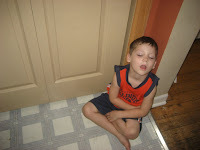 I went looking for him and found him like this . . . .
Sound asleep, leaning against the pantry door. Only under the age of six is this cute. Imagine a thirty year old (namely me) doing that. . .
Oh, almost forgot. Check out the blog sometime. I lost your number!